Of course you spend some of your time in reading books and stories. Every once in a while you read a book where the hero, who is of average build, disappears from the scene for some reason or other; and when he reappears, after an absence of a couple of years, his friends fail to recognize him. When they are convinced that he is the same man, they say, "But what has happened to you? You are about 4 inches wider and about 8 inches more around the chest than you used to be." In the last three months, I have read two such books. In one of them, the hero's family got into some financial difficulty, and he got a job on a fishingboat in the North Sea; and in the space of two years, he raised himself from seaman to mate. In the other story, the hero was supposed to be threatened with consumption and was sent away to a logging camp in our own Northwest; and when he returned, had affected a complete physical transformation. These story-writers might be suspected of using a scene like that so that their heroes could have a fine shape and the great strength that every well-regulated hero should have; but at that, they are not very far from the truth. I have known such things to happen in certain cases. I knew a man who went to the Klondike in the first gold rush. When he left this city, he was 23 years old and weighed, maybe 135 lbs. When he returned two years later, he was no taller; but he weighed 185 lbs., and he did not carry and ounce of surplus flesh. He seemed to be all bone and muscle. On his outward journey, he wore a size 36 coat, which hung loosely on his shoulders. On his return journey, he wore a size 42 coat, which fitted him closely. His shoulders were very much broader; his arms and legs thicker; and even his wrists and ankles were bigger. Also, I have known other men who went away for a couple of years and lived in the out-doors, and came back no bigger than they were when they started. It happened that the first man had done a whole lot of hard work, had climbed mountains, dug ditches, paddled canoes and carried heavy packs over long trails. Of course the pure air and the outdoor life helped him; but pure outdoor air is not enough in itself to account for such an enormous increase in size and strength. If the heroes in those two novels made the gains which the authors claim, it means that those two particular heroes did a lot of hard muscle work. I understand that in a lumber camp, the work is very hard, and it involves the lifting, handling and moving of very heavy weights. It takes more than a little muscle to swing an axe, and to cut down a tree which is a couple of feet thick. It takes even more muscle to stand at one end of a two-man saw, and saw that tree into sections. The peavey, or "canthook," which lumbermen use in handling logs, is an instrument which enables a man to greatly increase his natural leverage; but even when using a peavey, a man has to have some weight and strength in order to move logs which weigh anywhere from 500 to 2000 lbs. When it comes to picking up one end of a log which weighs several hundred pounds and helping another man to carry it a great distance, or when it comes to up-ending a lighter log, letting it fall across your shoulder, and carrying it away, then you have to have bodily strength in great quantities. It is well known that cold is a peptic stimulant; that is, it creates an appetite. Heavy work also creates an appetite. The combination of the two produces a kind of appetite which can be satisfied only by a large quantity of highly nourishing foods. A great deal of lumbering is done in the cold weather at high altitudes. I claim that if you, being sickly and undersized went to a mountain lumber camp and did the kind of work I have just described, you would, in all probability, make bigger gains in a winter's work, than you could in as many years spent at calisthenics or "bending exercises." But if you went to the lumber camp in some clerical capacity, or as cook, you might gain a little in size and strength; but not much more than you would gain if you had stayed home and held the same kind of a job. If a man ships as a "hand" on a sailing-vessel, it means that he has a job which takes the hardest kind of physical work; and if he spent his time climbing up and down the rigging, hauling on ropes in order to hoist heavy sails, and assisting in loading and unloading heavy cargoes, he would get a fine physique. If he shipped on a steamer as a wireless operator or something of that kind, he would not be likely to grow very much bigger and stronger than he was at the start. You can't transform yourself physically simply by going to a lumber camp or by going to sea. The thing that produces results is what you do after you get there. Your body will shape itself, and your muscles will develop, according to the kind of work you do; and if you know how to get that work either in the form or labor or play, you can develop yourself just as rapidly in your own home, as you can in the furthest lumber camp or most distant sea. One time, when I was tired of hearing enthusiasts talk about sleeping porches and ventilated gymnasiums and proper food and clothing, I said that if a young man would do what I told him to, he could take his exercises in a damp, unventilated cellar, that he could eat anything he pleased, smoke a pack of cigarettes a day, and drink wine or beer; and that if he got sufficient sleep and did the right kind of exercise, I could make him into a "Strong Man" in a very short space of time. Of course a man will naturally make better progress if he works under pleasant conditions; but it seems to me that sometimes there is a great deal too much attention paid to getting those pleasant conditions, and too little attention paid to the way a man works. Though you may think so, I am still talking about the same subject; which is, that great results come from great endeavor, and that great muscular development and super-strength can be acquired only by a certain kind of work. If you are willing to do that kind of work, and do it intelligently, you can get results in your own bedroom just as well as anywhere else. In the stories mentioned in the first part of this chapter, it is noticed the hero's friends always exclaimed about the difference in the size of his chest and shoulders. They did not say, "My, your legs have gotten big!" or, "What wonderful arms you have! "; but, "What a chest you have!" and, "My, you have spread out around the shoulders!" In chapter 8, I described one exercise which will increase the size of the chest by increasing the size of the rib-box; and I urged you to practice that exercise even if you are not interested in the subject of great strength. I am convinced that the kind of chest which gives plenty of lung room, is the one which a super-strong man must have. I know that the average man can greatly increase his vitality and make himself somewhat bigger and stronger, merely by increasing the size of the chest, even if he does not take special exercises for the other parts of the body. Therefore, I believe that if a man actually wishes to "make himself over," the first and most important thing is to increase the size of the rib-box. 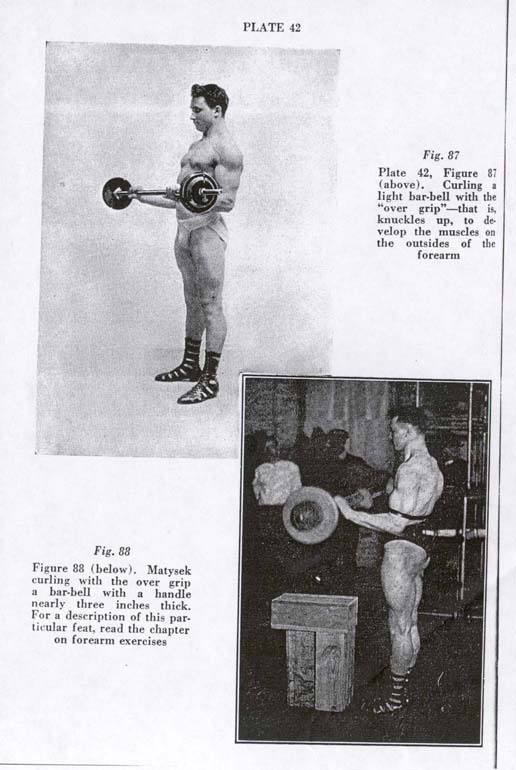 In the fall of 1923, I wrote an article in the Strength magazine in which I made a comparison of British and American lifters. I pointed out the fact that while England had a large number of first-class lifters among the smaller men, they had very few first-class big men. Also, that in this country, we had a great number of "Strong Men" in the heavy-weight division, whereas, England had only one or two. 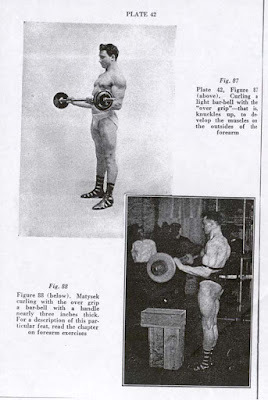 This article excited a good deal of discussion in the English sporting papers; and in their comments, they tried to make it seem as though I favored bulk and brute strength, in preference to lifting skill. That is not quite the truth. I cheerfully admit that I do find it a much more interesting and, I believe, a more valuable work to develop men, that to develop lifters. One English writer admitted the shortage of first-class heavy-weights in Great Britain; but claimed that they "did not breed big men in England." Now I have seen plenty of big Englishmen; tall, broad-shouldered, deep-chested fellows, who could easily be trained into high-grade amateur "Strong Men." Some of the most famous "Strong Men" in history are Scotchmen. From Ireland, there come a large number of gigantic weight-throwers, and I cannot believe that large men are scarce in England. But perhaps none of their big chaps become interested in bar-bell work. My point is that the breeding has little to do with the cultivations of super-strength, and that individual training and individual effort can overcome the handicaps of heredity. A man whose parents were short in stature, is not likely to become very tall, himself; but one does not have to be a very tall man in order to be a big man. A perfectly developed man of 5 feet 8 inches, will weight anywhere from 165 to 185 lbs., according to the size of his bones. Steinborn stands less than 5 feet 8 inches, and weights 215 lbs. in a hard condition. Adolph Nordquest, who weighs about as much, stands 5 feet 9 inches. Certainly there must be thousands of men of that height in England. In the article referred to, I mention some cases of phenomenal growth which have come under my observation. One English authority claimed that no man could make the increases I cited "unless he had the bodily framework on which to build"; apparently overlooking the fact that even at the age of thirty, it is possible to make a marked change in the bony framework of the body. I do not mean that you can make the bones longer or increase your height, or the length of your arms and legs; but I positively have seen cases where the bones became thicker and stronger, although such cases are somewhat rare. If you examine a man's skeleton, the length of the bones will give you an accurate idea of how long that man's arms and legs were. The hipbones, which constitute what we call the "pelvic basin," will show you how wide his hips were. The size of the rib-box and the articulation of the shoulders, give an idea, (although not an accurate one,) of his shoulder-breadth. I do not claim that it is possible, after maturity, to make a man's hips wider by promoting the growth of the bones of the pelvis; although by properly developing the muscles of the upper thigh and hip region, it is possible to make them an inch or two wider. While it is not possible to make the ribs, themselves, any longer, it is distinctly possible to increase the size of the rib-box by lengthening the cartilages which connect the ribs with the breast-bone. By the time most men are twenty-five years old, these cartilages have entirely lost their original elasticity; and if a man of that age has a flat chest, he gets the idea that he is condemned to have a flat chest for the rest of his life. By doing certain exercises, notably the one illustrated in Fig. 42, and combining them with special breathing, it is possible, in a few months' time, to convert a flat chest into a high-arched chest. The breast-bone, which has originally been flat, assumes a distinct outward curve. The breast-bone is made up of three sections, and its shape determines the appearance and size of your chest. The lower two sections are joined together so tightly that they seem to be one bone; but the upper section is more loosely joined to the other two. However, a high-arched chest is more dependent upon the shape of the rib-box than upon the amount of curve (or lack of curve), in the breast-bone. The round-shouldered man almost invariably has a high-arched chest. Mr. Arthur Thomson, the eminent anatomist says, "After the age of twenty-five, when all the bones are fully ossified and the figure set, any form of exercise will have but little influence on the form of the thorax, except that it stimulates a more healthy respiration. Yet we cannot but admit the effect which the exercise has had on the man, for he appears now with braced-up figure and square shoulders. The increase in breadth of the chest is not due to any marked increase in the capacity or form of the chest-wall, but is due almost entirely to the increase in size of the muscles, brought about by exercise. As has been shown, some of these muscles lie between the blade-bone and the chest-wall, and one can readily understand how any increase in the thickness of these layers will tend to push upwards and outwards the blade-bone from the chest-wall, and so impart to the shoulders that squareness which is so desirable in the male figure." According to Mr. Thomson, it would seem hopeless to alter the size or shape of the rib-box after the age of twenty-five, and yet I have seen men of thirty-five increase their chest measurements six, eight, ten, and, in one case, twelve inches. Such an amount of increase cannot be make simply by developing the muscles which overlay the ribs. The circumference of a circle is, roughly, three times its diameter. If you were to develop the pectoral muscles on the chest so that they were one inch thicker than before, and developed the back muscles so that they were one inch thicker, it would mean that the whole chest would be two inches thicker, and that would account for only a six-inch difference in the girth of the chest. The pectoral muscles can be made very big and thick, and the muscles across the back of the shoulders are capable of high development; but I do not believe that any of these muscles can be made two inches thicker. Note that Mr. Thomson speaks only of the increase in the breadth of the chest. When you increase the size of the rib-box by promoting the elasticity of the rib-cartilages, the chest becomes deeper from front to back. The difference between a very shallow chest and a very deep one, is just the difference between weakness and super-strength. In converting a small and shallow rib-box into a big, deep and roomy one, part of the increase is obtained by developing certain muscles on the outside of the chest, which have a tendency to lift the ribs; and another part comes from the pressure from within, furnished by the growing lungs. When my English critic said "it was impossible to make enormous gains unless one had the bodily framework on which to build," he ignored this possibility of increasing the size of the chest itself. In my article I mentioned the case of a boy who had increased his chest measurement 7 inches in one month by the use of bar-bells. It would have been utterly impossible to gain that much just by developing the muscles on the upper body, because that would have meant making the chest muscles and the back muscles an inch thicker than before. So much development can't possibly be gained in thirty days' time; but since the boy referred to did actually make the 7-inch increase, at least half of that gain was due to an increase in the size of the rib-box. When the lad started his normal chest measurement was 29 inches. Bu developing the muscles on the outside of the chest he could possibly have brought his chest measurement up to 38 or 39 inches by a couple of years' steady work. All this gain would have been muscular, and his original framework would have remained the same. At the end of thirty days he had a considerably bigger bodily framework than at the start of his training, and with that framework, by developing the exterior muscles, he might have eventually gotten up to a 40-inch chest measurement; but as it happened, he continued at the exercises which expanded the chest, kept on increasing the size of his frame, and at the end of the year had a 43-inch chest, making a total gain of 14 inches in the year. You may object that this boy was only seventeen years old when he started, and that therefore he was still growing. That is unquestionably true. If he had never exercised at all, it is quite likely that his chest would have increased from 29 to 32 inches in one year by natural growth; but at that, his chest never would have been more than 36 or 37 inches at the age of twenty-one, because he was originally built on slender lines. I do not merely claim that he enlarged and improved his bodily framework. I know it. If I had the space I could tell you of almost as remarkable gains made by men who had passed the age where growth is supposed to stop. I saw a man of thirty years increase his chest measurement from 35 to 44 inches in one year; and during that time his shoulders became nearly 4 inches broader. I know a man, Professor Lange, who, at the age of thirty, started to practice the exercises which I have described in chapters 8 and 10. He had been interested in athletics all his life, and at the age of eighteen his chest measured only 30 inches. At the age of thirty his twelve years' practice had increased his chest to 36 inches. By specializing on chest development he increased the measurement within the next few years to 48 inches. When he chest grew, he grew all over. So far as I know, he did not grow any taller; but the development of his back, his shoulders, his arms and his legs kept pace with the growth of his chest. After he was thirty his upper arms increased from 13 ? inches to 18 ? inches, and his thighs from 21 inches to 28 inches. Even his forearms and the calves of his legs increased at the same rate, and the development of those parts of the body is supposed to be limited by the size of the bones below the elbow and knee. If that man had had a really big frame, it is impossible that his chest would have measured as little as 36 inches at the age of thirty. The fact that he has almost the deepest chest on record is positive proof that he made the rib-box larger. Therefore, he deliberately and successfully altered his own bodily framework. I regret that I cannot show you his pictures. He will not allow them to be published, although some pictures of him did appear in the Strength magazine in 1919 and 1920. I could go on multiplying the number of these cases. The three I have just mentioned are exceptional; but they prove what can be done. For a bar-bell user to gain from 4 to 6 inches in chest measurement during the first three months is so common a happening that it is hardly worthwhile mentioning. There is an immense difference between the shape of a man who has thus developed himself and the shape of a man who has increased his size just by thickening and developing the muscles. There is a certain relation between the size of the arms and chest in a well-proportioned man; in fact, there should be a fixed relation between the sizes of all parts of the body. A bar-bell user who has a 17-inch upper arm usually has a 44- or 45-inch chest and a 24-inch thigh. If his upper arm is 16 inches, his chest is 43 to 44 inches, and his thigh about 23 inches. I have seen professional gymnasts, especially Roman-ring performers, with 16 ? inch upper arms and only 39-inch chest and 20-inch thighs. That alone explains why the average bar-bell user so greatly excels the average gymnast in the matter of bodily strength. As I said in a previous chapter, an increase in the size of the rib-box is always accompanied by a corresponding and proportionate increase in the breadth of the shoulders; which is puzzling, because the collar bones do not seem to become any longer, although the shoulder blades become wider spaced; that is, set further apart. A man with a 36-inch chest will have shoulders about 17 inches in width. A 40-inch chest usually means shoulders about 19 inches wide; whereas, a "Strong Man," that is, an individual with super-strength, may have a 46-inch chest, with shoulders that are fully 23 inches across. The deltoid muscles lie on the points of the shoulders, but no man could increase the width of the shoulders from 17 to 23 inches by making each deltoid three inches thicker; and one would have to do that in order to add six inches to the shoulder-breadth. While Mr. Lange's chest was increasing from 36 to 48 inches, his shoulders became six inches wider, notwithstanding the fact that a large part of the gain in chest girth was due to the deepening of the chest box. When a novelist describes his "Strong Man" character, he is apt to say, "His broad shoulders and deep chest gave indication of his enormous physical strength." It seems to be an accepted idea that depth of chest is a sign of great natural vitality, and that broad shoulders indicate the possession of great natural power. (That is a case where the popular or general view is the correct one.) I go further and say that you can deliberately make your chest deeper and your shoulders broader, and that as you do so your natural vitality and strength will increase to an extent that will go a long way towards putting you in the class of the super-strong. The bigger rib-box will mean more lung room, and big, high-quality lungs make not only for endurance, but for vitality and driving power. The deep-chested (and therefore big-lunged) man will sustain without fatigue a series of exertions, any one of which would exhaust a shallow-chested, small-lunged man. The gain in the width of the shoulders is accompanied by a gain in sheer arm and shoulder power, which is due to the greater and more advantageous leverages. If you can make your shoulders broader by making your rib-box bigger, you will find that you are possessed of an entirely new kind of strength, even if you pay little attention to developing the muscles on the points of the shoulders and the front and back of the upper-body. If, in addition, you can properly develop those muscles, you will become so strong that you will be a source of pride to your friends and a terror to your enemies. It is a great advantage to a "Strong Man" to have fairly wide hips; but the size of the hip-bones which constitute the "pelvic-basin," cannot be materially altered after full maturity, as the individual bones are firmly welded together. Nevertheless, the shape and power of the hips can be greatly improved and increased by the exercises in Chapters 2 and 4 for the thighs and lower back. The "fashionable" figure is that of a man with wide shoulders and narrow hips. Novelists, and some writers on art subjects, seem to think that small hips add elegance to the figure; whereas narrow hips are a sign of immaturity. At present, women have such a craze for narrow hips, that the corset, which in other days constricted the waist, has been extended downward so as to act as a compressor of the soft flesh around the hips. Reason? They think that small hips make them look more youthful. "The boyish figure!" That is their present ideal. In men, unusually narrow hips are often a sign of arrested development. The hips and shoulders should grow wider between the ages of 18 and 23, after the full height has been attained. All of you are familiar with the spectacle of a youth "broadening out" as he approaches maturity. I have always found it much easier to give perfect proportions to a beginner with good hips and comparatively narrow shoulders than to the beginner who has fair shoulders and poor hips. Qualify that, by saying my idea of perfect proportions, for I believe that a man is best built for bodily strength, when the girth of the hips is three or four inches less than the girth of the normal chest, (not the expanded chest). Saxon, Steinborn and men of their type have hips that are smaller in proportion to their chests. Undoubtedly, the Sandow-Donald type is more pleasing to the eye; but the Saxon-Steinborn type have more sheer bodily power. Let us see how it works out. In the Strength magazine, we held a discussion as to the proper relative size of the hips and thighs. It appeared that is most men who combine great strength and great development, the thigh girth was about 60 percent of the girth of the hips. (Both measurements taken at the largest part.) For example; Sandow's hips measured 39 inches, and his thigh 23.7 inches. The thigh measurement is almost exactly 60 percent of the girth of the hips. Now Sandow's thigh-development was a thing to wonder at, and when you look at his picture, it seems impossible that a man could have more powerfully developed thighs with such trim hips; yet I have seen men with smaller hips and bigger thighs; for instance, Mr. Fred Rohde, Fig. 83, has a 25-inch thigh and hips measuring only 35 ? inches around. I could name several others whose thigh measurement is more than 60 percent as large as the hip measurement. The foregoing reads almost as though I were trying to dodge the issue and to claim that great development could be acquired without changing the size of the bony framework of the hips. The hips may not actually get any wider; but unquestionably, they seem to get bigger as the chest grows in size. Look at the picture of Mr. Frank Dilks in Fig. 84. This man was extremely slender before he started to train, and the fact that he was above the average height, accentuated his slenderness. Since he had only a 36-inch chest and a 10-inch upper arm, his hips couldn't have been much more than 35 inches around. This picture of him was taken after one year of bar-bell exercises, and during that time, his chest had increased to 44 inches, and his thigh, from 20 inches to 24 inches. What his hips measure at present, I do not know; but surely they must be at least 40 inches around. While in the photograph they appear noticeably smaller than his chest, they are not so small as to give any impression of weakness. This is because Mr. Dilks, by practicing heavy exercises for the legs, developed the muscles on the upper part of the thighs where they emerge into the hips. When Mr. Lange started at thirty years, with his 36-inch chest, his hips were of a size that corresponded to his chest. While his chest was increasing from 36 inches to 48 inches, his hip measurement increased about 7 inches, and his pictures in my private collection, show that at present the difference in size between his chest and hips is just about the same proportion as the difference between Sandow's chest and hips. The important thing is that as your rib-box increases in size, the hips either grow, or seem to grow, in proportion; for I have never seen a man with a really big rib-box, who had inadequate hips. Perhaps the explanation is that the big-chested man can add to his muscular development with comparative ease, because there is very little muscle on the sides of the hips. It is possible to increase the hip measurement by developing the muscles which compose the buttocks, but that does not mean that you make your hips any wider. In Chapters 2 and 4, I recommend that the beginner at bar-bell work start with exercises for the thighs and the lower part of the back. The strength of the lower-back is intimately connected and controlled by the size of the hips and the development and strength of the upper-legs. Some writers seem to think it indelicate to refer to the hips, especially to those muscles which compose the buttocks, and which are such an important link in the chain of muscles which hold the body erect. Big arms are spectacular; a big chest is almost indispensable; powerful legs are a great help; but to the man seeking super-strength, one great requisite is strong loins. No matter how big your upper-arm is, you cannot exert the full strength of that arm unless the muscles of your shoulder are even more powerful than the arm-muscles. No matter how big your thighs are, they cannot exert their full strength unless the hips and loins are even stronger. That is why I was so particular in Chapter 4, to give you exercises which develop the hips and loins in connection with the leg muscles. The most striking example I have every seen of strong loins and hips, is Henry Steinborn. This man trained himself to a point where he could take 400 lbs. on his shoulders and do the squat many times in succession, as in Fig. 27. His constant practice of the quick lifts had given him immense power in the loins. In lifting heavy bar-bells from the floor to the shoulder, he could show more energy than any athlete on record. He could lift more weight clean from floor to the shoulders than any other athlete in the world; and in that style of lifting, the power that raises the weight from the floor comes from the thighs and the loins. In writing and article about his man, I said one stamp of his foot, he could crush the life out of any creature smaller than a tiger. His strength of leg and loin was the explanation of this unparalleled quickness of movement. In jumping, springing and quick lifting, the impulse comes from the hips; and Steinborn, who weighed 215 lbs., could move his body about with more rapidity and greater ease than even such famous fancy dancers as Nijinsky and Mordkin. In a later chapter, I will say a few words about the connection between loin strength and general vitality.